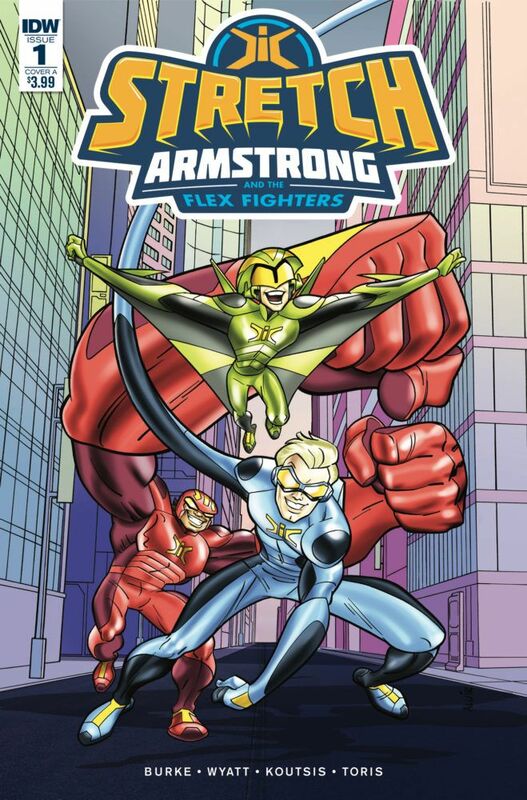 If you’re a fan of Netflix’s original animated Hasbro series Stretch Armstrong and the Flex Fighters, I have good news and bad news for you. 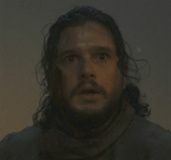 The bad news is, if you’re already all caught up on all 13 of Season 1’s action-packed episodes, we’ll all have to wait together to find out if there’s going to be a Season 2 and when new episodes might be showing up. The good news, however, is that the adventures of Stretch and his pals are continuing in the pages of IDW’s new comic series by the same name, and written by Kevin Burke and Chris “Doc” Wyatt, who are the writers of the animated series itself! The comic series, which will run for six issues in two three-issue arcs, takes place smack in the middle of Stretch‘s season, so you don’t have to worry about any spoilers. It does, however, shed a little more light on the Flex Fighters’ friendships and working relationships, as well as taking some time out to fill in their backstories a bit more. 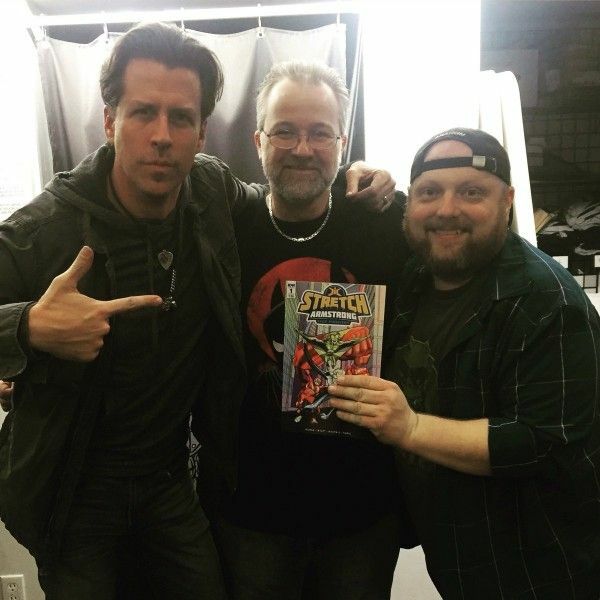 I had a chance to chat with Burke and Wyatt about both projects, how writing for the TV series and comic book compare, and how they’re different. 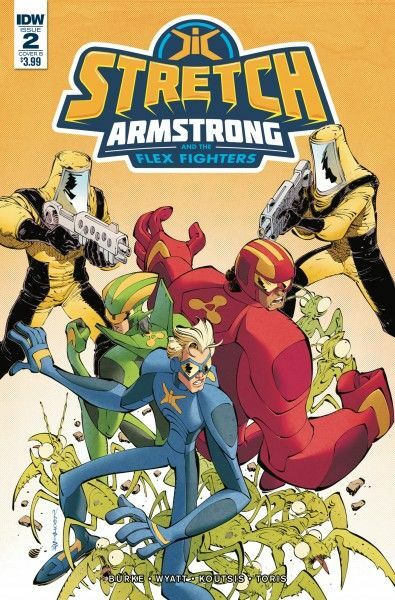 Fans of Stretch will also find some teases for both the comic book stories and and upcoming Netflix special featuring Stretch Armstrong and the Flex Fighters. There’s a lot of good stuff in here, so let’s dig in! Is this your first time writing a comic book? Kevin Burke: We’ve written a few digital comics that tied into the season of “Avengers Assemble” that we ran (Season 2), but you’re correct in that this is our first, actual, tangible, takes-up-shelf-space, have-to-bag-and-board, holy-cow-this-is-the-real-deal comic book. No doubt, reading comic books as a kid is what planted the seeds that led us into our film and television careers, yet it’s taken us this long to actually write a physical comic book. And let me tell you, the experience of holding and flipping pages in your first comic book IS as exciting as one would imagine. Eight-Year Old Me is finally impressed with the achievements of Adult Me. What are some iconic comics from your childhood (or adulthood) that have had a big influence on you? Burke: We’re lucky that, to our generation, comic books (specifically super hero comics) grew up WITH us, so there are a number of phases in our lives which comics proved to be highly influential. I think I’ve read Spider-Man consistently since he first got his black costume, and some of the books/runs that will always stick with me are the original Secret Wars, Dark Knight Returns, Watchmen, Akira, Sandman, and Seekers into the Mystery. Then later in life, things like Planetary, Bendis/Maleev’s Daredevil, Ennis’ Punisher MAX run, and Saga all have had a giant influence. Right now I’m in the middle of reading the Kirby Fourth World Omnibus and it’s blowing my mind. There are more insane ideas in a single issue of that than some titles have in their entire run. Chris “Doc” Wyatt: Comics that have stuck with me since childhood include the Spider-Man story Kraven’s Last Hunt, the Iron Man arc Armor Wars, and anything Neil Gaiman. I was also a big Ted McKeever fan, Metropolis in particular. And I loved Baron and Rude’s Nexus. Right now, I’m all over everything that Tom King writes. I have all of Jeff Lemire’s stuff on my shelf, and every once in a while I’ll pull down Underwater Welder, or Essex County, or Lost Dogs when I want to wallow in raw emotion. When did the idea and opportunity to write a Stretch Armstrong and the Flex Fighters comic come up? 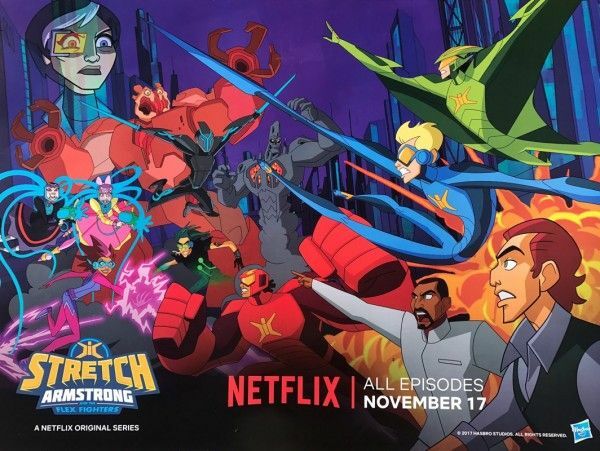 Burke: We had been writing and producing the animated series for Netflix when Hasbro and IDW asked if we were interested in branching into comics, and we jumped at the chance. Comic books! That’s the whole reason we’re doing stories like this in the first place! 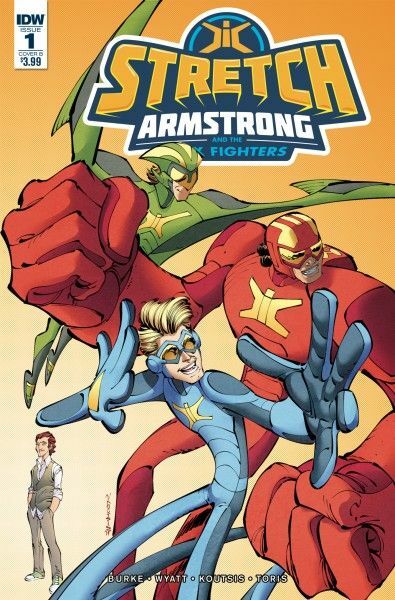 Since Stretch Armstrong and the Flex Fighters is a completely new universe, created from the ground up, we were thrilled to be able to expand the kinds of stories we were telling into other mediums. 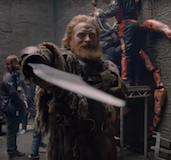 We never saw this as only a TV show – it’s a rich new world with the potential to branch out into comics, games, movies, and who knows what else. I’d love to see some “Stretch Armstrong” LARPing, but maybe that’s just me. 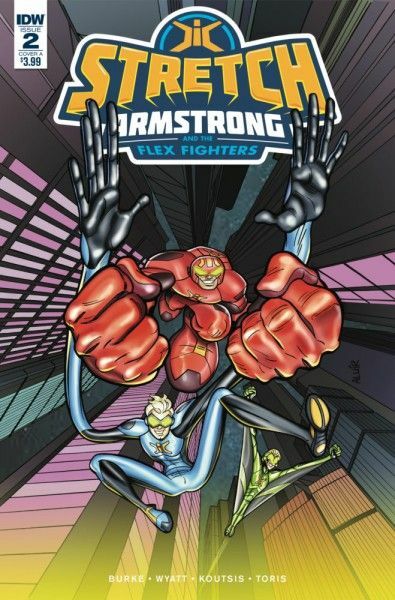 Wyatt: I want to see a Flex Fighters breakfast cereal hit the shelves. If a cereal company would do that, we’d volunteer to write the activities page for the back of the box. Burke: An entire breakfast cereal made out of stretchy materials, like gummy worms. I’d totally eat that. Can you talk about the artwork of Nikos Koutsis and Aluir Amancio? How did you react when you first saw it? Burke: We loved it! It was important to us that this comic book didn’t just look like screen-grabs from the television series – that it played to the visual strengths that only comic books can achieve. For this universe to expand in all the directions we dream of it going, we didn’t want to get stuck with one singular look – we wanted this to be more like the versions of the Teenage Mutant Ninja Turtles or the variations of Spider-Man we’ve seen in different media over the years. We totally love the look of our show, but didn’t want the comic to feel like a lesser, more static version of that. Nikos totally nailed this in the book, his poses and angles suggest the movement and physics of the show, but in a way that is specific to comic books. Where and when exactly do the comic book adventures take place? Wyatt: The first three-issue arc of the comic takes place between Episodes 8 and 9 of the show. I don’t think it’s a spoiler to say that we wanted to tell a story during a time right before some big reveals started happening for the Flex Fighters. 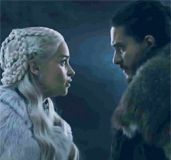 The second three-issue arc will take place between episodes 9 and 10 of the show. Are there any other teases in the comic for either an upcoming (and as of yet unannounced) second season, or the Choose Your Own Adventure special? Wyatt: The “Stretch” comic book doesn’t tease the upcoming special at all, but its story is definitely canon. Often spin-off media isn’t fully part of the main franchise, but in this case it is. For example, sometimes you’ll see stuff introduced in a TV show reflected in that show’s spin-off comic, but you don’t see things first introduced in the comic showing up back on TV. That usually happens because the writers of the comic have seen the TV show, but the writers of the TV show aren’t necessarily aware of what the comics writers are doing. But in the case of “Stretch”, we’re writing both the show and the comic, so we can integrate the two. Our comic’s not so much a “spin-off” as it is just more story in this world, and it fits nicely into continuity. Burke: And one of the big strengths of doing the comic is that it gives us a chance to explore some character backstories that we’ve always known, but hadn’t yet had a chance to get into on television. The comic gets to go some deeper places. IDW said that a villain introduced in the comics will later make their debut in the series; what can you tease about this character? Burke: Well, we don’t want to give too much away, but the comic and the TV series are definitely intertwined – so we are laying the groundwork for what will hopefully be some exciting reveals in the animated series’ future. 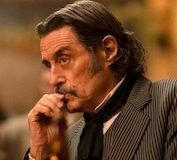 Wyatt: We won’t say anything about the character that’ll move from comics to TV except this: It might not be the character you think it is. How did writing for the TV series differ from writing the comic book? Burke: Well, the TV series is ground floor of this universe, the foundation from which all of the spin-off material like the comic book comes from. Writing animated television, especially very serialized television that streaming services like Netflix create, is a very specific skill that is unlike writing a feature film, comic book, or novel. It’s important to lean into the strengths of whatever medium you’re writing for, which includes how you structure your acts, how you reveal information to the audience, how much can be told visually or through dialogue, etc. Doc and I, with the help of Victor Cook (the other Executive Producer and Supervising Director of the show) developed the broad, overarching season story, and then Doc and I broke the stories for every episode in detail, structuring the show so that it first seemed like a simple, episodic boys action show, only to discover that this had all been leading to some surprising revelations. The writers we brought in to turn our outlines into scripts then brought their own sense of comedy and action to the show while learning how this very specific world of the Flex Fighters works. The comic book, on the other hand, was a totally different thing. Comic books aren’t just television with panels (or books with pictures), they are their own medium, and we wanted to play to those strengths and tell a different style of story than we can on TV. In the first arc of the comic, we focus each issue on one of the individual Flex Fighters, letting them narrate the story, enabling us to get into their heads in a way we couldn’t do on television with the ensemble cast. This gives the reader a whole a different perspective on events and allows us to get deeper into the backstories and motivations of Jake, Nathan, and Ricardo. Comics have the ability to change perspective and pacing in a way that television often does not, and it’s great to take advantage of that. 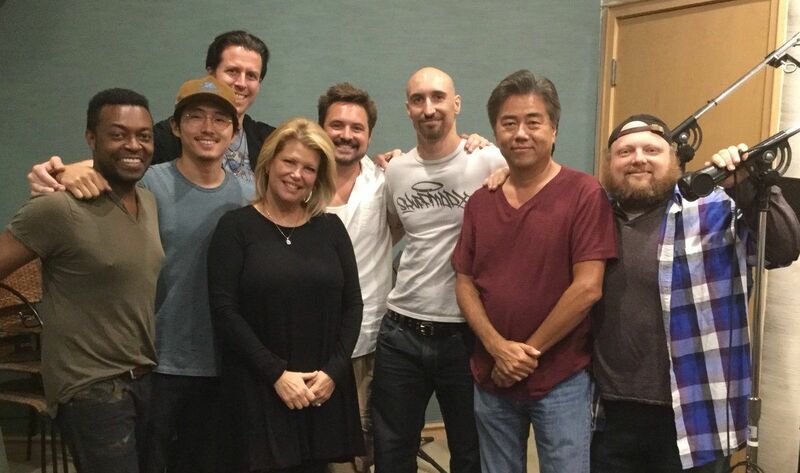 Wyatt: Another big difference is that producing the TV show is a big collaboration involving more than a hundred people including executives, board artists, animators, voice actors, musicians, etc… With the comics, it’s just us, the artists, and our editor, Joe Hughes. The big team collaboration of TV is a wonderful thing to be a part of, with everyone throwing in their ideas, always trying to plus up the show, but it’s sometimes a nice change to do something smaller. Also, animation takes so long that from the time we write the script to the time it’s on air is 18 months at a minimum. With comics, we can go from script to stores in only a couple of months. Were there any beats or arcs that worked better in comic form than in TV series form, or vice versa? Burke: Definitely. In the comic, we had the ability to jump into flashbacks in a way we didn’t on the series, which was inspired by the structure of stories like Watchmen and The Killing Joke. 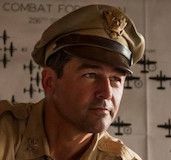 Most of the television series is very urgent, in the moment, but the comic allows us the chance to pace things differently. 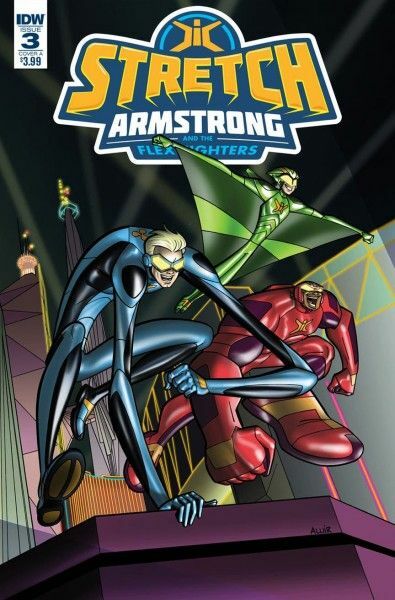 The TV show has the exciting ability for dynamic moving action, which, in a series starring three elastic heroes, is vital. The comic’s dynamics, with static panels, are obviously different, so we aimed for more emotional reveals to keep the story moving. Is the plan to keep the comic going between seasons, or is the current one meant as a one-off? Wyatt: The first IDW comic run is six-issues, two three-issue arcs that will be collected in two separate trades. Burke: We have a TON of stories about these characters, so we could write this indefinitely, as long as people want to read them. SO READ THEM! A lot of ideas we pitch in the writers’ room, some of our favorite ideas, end up having no space in a half-hour cartoon, so we’ve saved some of the best stuff for the comic book! What’s up next for the team behind Stretch Armstrong and the Flex Fighters? Burke: We’ve been getting this question a lot, and we can’t give out any highly confidential secrets just yet, but we can definitely tell you that the best is yet to come! Wyatt: By the way, we’re going to be doing some Con panels and signings to support the show. Look for us at C2E2, SDCC, and a few other Cons that are TBA. Announcements about what’s next could happen at these conventions. For Doc, thinking back to Napoleon Dynamite, how did the success of that film open more doors for you? Did you ever think it would lead to writing for animated series / comic books, or was that always the dream? Wyatt: Writing TV and comics was definitely always part of the dream. Producing Napoleon was an amazing experience, and it opened doors for sure. I still get asked about it all the time, and I happily tell all my stories from set. Kev’s heard them all, millions of time. Jon Heder from Napoleon plays our villain “Multi-Farious” in Stretch, by the way. For the both of you, what was your reaction upon learning that Rocket & Groot had earned an Emmy nomination? Do you think animation, in general, gets the credit it deserves as an art form or is there still a long way to go? Burke: I was in complete denial of the nomination at first. I was up early, writing, when the Emmy noms came out and I thought it was too good to be true. Nope, no way, must be a typo. Not until Cort Lane (from Marvel) contacted us did I allow myself to accept it was real. And that specific short that got nominated was the very first idea we had for the Rocket & Groot series. It was the easiest pitch, everyone was immediately onboard, and I’m thrilled with the results. What’s so much fun about it is that it’s visually driven storytelling, very cinematic. “Space Walk” is complete story with stakes and a character arc, but hardly any dialogue. It’s a very different direction from a lot of the longer Marvel projects we’ve written over the years. To get such high recognition is an honor. As for animation as an art form, it’s clear that in recent years, with such things as the addition of the Academy Award, the respect for it has grown considerably, paralleling the technology that allows it to be made. Also, there are so many more outlets for animated content right now that the sky’s the limit. We no longer think of animation as something that’s always 30 minutes, aimed for a Saturday morning audience. It can be short, it can be long, it can be 2D, 3D, VR, whatever. If you haven’t, you should always check out the Oscar-nominated Animated Shorts – I’ve seen some of the greatest, groundbreaking films of my life in that category. And on the feature side, we’ve seen incredible growth. In the 80s and part of the 90s, comparatively, there were very few animated features made, and not all were worth seeing. Now it seems like every weekend there is a new, amazing animated film with an enormous, high profile cast. There’s more quality animation out there than people have time to watch. And there is no longer a sense that this is kid’s stuff, that you need to outgrow it. These are amazing stories, new mythologies, that people will take with them their whole lives. So yes, in terms of quality, and respect for that quality, we are living in a golden era of animation – and I’m confident it’s only going to get better. Stretch fans, be sure to check out my chats with executive producer Vic Cook and series star Scott Menville for more! Get caught up with Season 1 of Stretch Armstrong and the Flex Fighters on Netflix now and keep an eye out for the IDW comic book on shelves at your local comic store!